If you have been following the news this summer, you may have noticed a trend of workers along the food chain and their advocates demanding better pay and better conditions for the work they do. July 24th was a National Day of Action to raise the minimum wage. Over the following week, workers at fast-food restaurants in major cities across the US walked off their jobs demanding a living wage of at least $15/hour. Then, during the first week in August, the Coalition of Immokalee Workers (CIW) and Student/Farmworker Alliance facilitated a Week of Action targeting Wendy’s, the last major fast-food chain hold-out in signing onto the Fair Food Program to ensure better pay and working conditions to farmworkers on Florida tomato farms supplying the restaurant chain. Last month we started a blog series asking how to transform our food and agriculture system. The above are great examples of workers taking the initiative and showing what is possible to achieve with organizing and collective action. CIW, a grassroots community organization primarily composed of low-income minority tomato farmworkers throughout Florida, has already succeeded in bringing 90% of tomato farms in Florida as well as eleven large companies like Taco Bell, McDonald’s, Subway, Whole Foods, and Trader Joe’s into its program. The program requires companies to pay an additional penny per pound of tomatoes and farms to follow a code of conduct and pass the additional money along to farmworkers. Farmworkers on participating farms are provided a premium, workers’ rights education, and a working complaint investigation and remediation mechanism. Multi-billion dollar companies have caved to the persistence of grassroots pressure and the logic that a penny a pound to ensure dignity of workers is a reasonable request. As Gerardo Reyes-Chavez, farmworker and CIW organizer, recently explained, the Fair Food Program is not just about the money; human rights violations such as worker beatings for water breaks are less frequent now. Through worker-led initiative, striking workers, the Wendy’s campaign, and the campaign to raise the minimum wage have all been supported by a growing number of consumers and advocacy organizations as well. Consumers are increasingly aware of and concerned with the well-being of those who grow, process, and serve the food we consume. There are signs of government support as well. Legislation introduced earlier this year would raise the minimum wage to $10.10 over three years, short of the $15 an hour living wage striking fast food workers are requesting now, but still a vast improvement over the current federal minimum of $7.25. The same legislation would also bring the tipped minimum wage up from $2.13/hour to 70% of the $10.10 regular minimum wage. CIW’s Fair Food Program bypasses legislation and relies on legally binding contracts, and has drawn broad support in pressuring companies. The success of both campaigns is hugely important and deserving of the attention and support they have attracted. But they are just first steps. Last year’s report The Hands That Feed Us found that low wages were only one problem facing farm and food workers. Lack of benefits, limited chances to move to more challenging and higher-paying positions, and discrimination were just some of the problems reported by surveyed workers. For undocumented immigrants, these problems are often magnified, as those workers are especially afraid to speak up. The report speaks to the depth of the issues. As successful as CIW’s Fair Food Program has been in improving lives of workers on tomato fields in Florida, it has not yet made farm work a sought-after job. And though fast-food companies should pay their own workers and workers along the supply chain well, low-wages are not their only fault. Tomatoes, for many of them, may be the most nutritious ingredient on the menu of otherwise junk food, most of which likely employs its own share of low-wage workers to produce, is purchased from farmers under unfair terms, is unhealthy, or possibly all of the above. Fast food companies are bringing in revenue by the billions and profit by the millions. Meanwhile farm and food workers often rely on food stamps and may not be able to afford the food they grow and serve. UNITE HERE addresses this dilemma by campaigning for both Real Food [and] Real Jobs. They’ve helped workers at universities secure contracts for decent wages with provisions for healthy food procurement as well. The Chicago Public School system, for example, agreed to get rid of frozen meals in favor of freshly prepared healthy food as part of contract negotiations with its cafeteria workers (though is now threatening to lay off hundreds of food workers). Both CIW and UNITE HERE (as well as Fair World Project) are members of the Food Chain Workers Alliance (FCWA), author of The Hands That Feed Us report cited above. FCWA may be one of the keys to the type of holistic transformation we’re looking for. The Alliance is bringing together workers and their organizations from throughout the food system, from farmworkers to warehouse workers and everyone in between. This provides not only a platform for worker organizations to support each other’s campaigns, targeting both companies and local governments, but also allows them to collectively work toward broader policy reform like immigration reform and raising the federal minimum wage. They also focus on capacity building for worker and worker organizers. When workers are empowered where they are, whether it be a tomato field, a fast-food restaurant, or anywhere else along the food chain, they can start to create change. At first that change may be better conditions for where they are, even if that means making an unsustainable system manageable, but if we continue to work collectively on all fronts and create the policy environment under which we can all thrive, eventually that change may transform the whole system. Send a letter to Wendy’s asking them to join the Fair Food Program. Tell Chicago Public Schools they need workers to prepare the fresh food they have committed to. 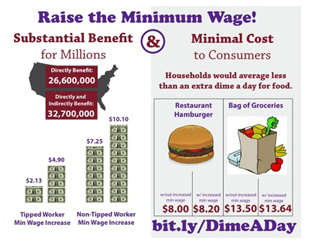 Show your support for increasing the federal minimum wage. Sign up for the Food Chain Workers Alliance mailing list to get updates on campaigns and actions.